There are many different ways you can get involved with the Caring Clowns International Organization. JOIN US – Interested in becoming a Caring Clowns International Clown? Simply complete our survey and we will contact you with more information. DONATE – Would you like to donate your money to a cause that will help spread joy to children around the world? Find out more here where you can submit your donation online through Amazon’s Simple Pay services. VOLUNTEER – If you are interested in donating your time to Caring Clowns International but are not interested in clowning you can fill out our survey. In addition, sometimes Caring Clowns International has specific volunteer opportunities. 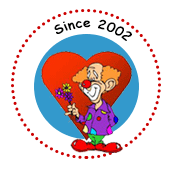 You can see what positions are available at Caring Clowns International’s Volunteermatch Page . HIRE US – Looking to hire clowns? Well, you might as well give your money to a good cause! Caring Clowns International clowns are available to hire for YOUR special event. Find Out More!